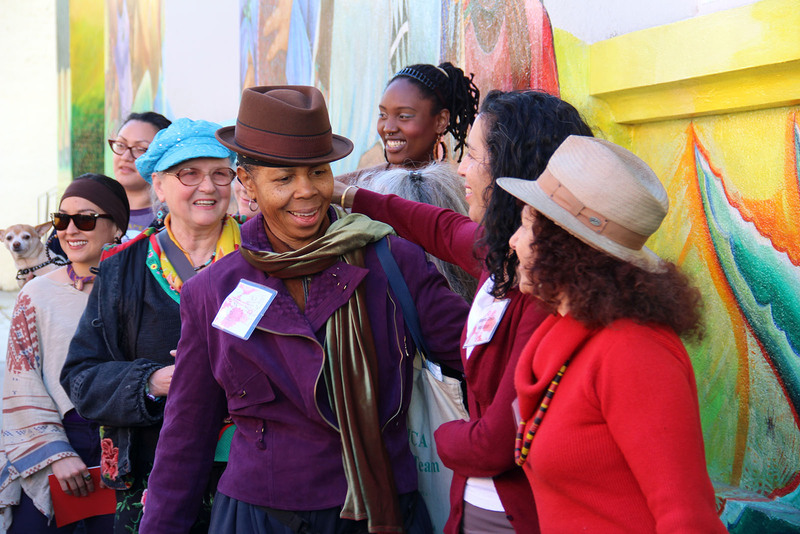 Muralists hug at the “Seven Flowers for Seven Artists” event, during which they were honored for the painting and restoration of the “Maestrapeace” mural that adorns The Women’s Building. Meera Desai stands on the sunny side of Lapidge Street and stares up at the vibrant four-story “Maestrapeace” mural that graces the Women’s Building. “I look at it and I see inspiration and I see beauty and I see something that will hopefully last a long, long time,” she says, gazing at the brilliant colors. People from around the world have flocked to this spot to view the work, which honors the contributions of women throughout history and celebrates female strength and independence. One of the largest murals in the city, it’s also one of the gems of the Mission District, in which art, politics and history collide. One of seven muralists who created the piece nearly 20 years ago, Desai is present for “Seven Flowers for Seven Muralists,” a celebration of last year’s renovation of the monumental work. Supporters from the community gather, point to their favorite parts of the piece, flip through souvenir booklets of its creation and history, and draw in chalk on the sidewalk. Teresa Mejia, executive director of the Women’s Building, encourages the crowd of more than 40 people to cross Lapidge Street and gather around her under the mural. Just as she is about to speak, chants from a nearby women’s rights rally grow louder and louder. The mural crowd hurries over to 18th Street to see that a large group, carrying banners and signs for equal rights, has come to a halt in front of the Women’s Building. “We will not stop until we have won,” a woman shouts over the PA system. Moments later, the group marches toward Valencia Street, chanting in a call and response. “Women’s!” shouts the leader. “Rights!” the marchers shout. Six of the original muralists — Desai, Juana Alicia, Miranda Bergman, Susan Kelk Cervantes, Edythe Boone and Yvonne Littleton (the seventh, Irene Perez, could not make it), clasp hands as they are honored for their work. They talk about the intense bonding experience of creating and restoring the artwork, which helps to focus on strengthening the power of women’s voices. The muralists share the credit. Next to them stands a group of young female volunteers who worked side by side during the work’s restoration. The original artists speak about the importance of helping this next generation of women muralists. Alicia says the muralists — ranging in age from 46 to 75 years — knew what seeds they were handing to these women and to the community. “We’re not going to be able to do this again,” she says. “But they are,” she adds, pointing to the young women. One volunteer, Aamber Newsome, remembers her fearful first day on the job. When Cervantes told her to crawl out of a window of the Women’s Building and shinny up the fire escape, she says her only thought was, “Is it a good day to die?” She joins in the crowd’s laughter at the memory. “I felt really lucky to be trusted with this legacy and to be one of the people who can help pass it on in the future,” Newsome says. Inspired by the experience, Newsome and other young women volunteers recently formed their own art collective, now working on its first design for a mural in Cypress Alley. Native San Franciscan Ariana Roman admired the mural as a child and is now a member of the new art collective. Overcoming her terror of the scaffolding to help in the restoration was like nothing she’s ever experienced. After the event, muralist Cervantes signs a souvenir book for volunteer Roman. Then, in a nod to the new generation of artists, a woman from the crowd approaches Roman for her autograph. “It’s just as meaningful as it was the day we did it,” Cervantes says. Thank you for the article. I’m one of the muralists.